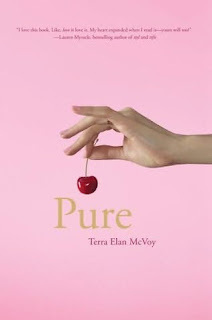 It's pretty and shiny and new and it was written by one of our MOST FAVORITE people in the world- our very own store manager, TERRA ELAN MCVOY! Yes, it's one of Little Shop's Not So Best Kept Secrets, but now we are ready to shout it out to the world and hope you will join us on Friday April 17th at 7:30 as we celebrate Terra, her book, and just her general wonderfulness that she brings with her everyday to Little Shop. Although her book is for teen and adult readers, we invite even her youngest fans to join us. We will have live music, drinks, cupcakes from Buttoncakes Bakery, and a reading or two from You Know Who. So, won't you join us? It promises to be our best party yet. We are all SO proud of Terra!!! Beyond the fact that we love her to pieces, its a really great book and we all look forward to her next one.